On the western shore of Alaska's Cook Inlet, lies a 60 mile stretch of coastline forming the eastern boundry of Lake Clark National Park. Approximately 130 airline miles southeast of Anchorage, Alaska, it is accessable only by boat or aircraft. Silver Salmon Creek Lodge is one of the few places along this shoreline. The lodge is located near the base of 10,000 Mt. Iliamna, an active volcano that occasionally spews a cloud of mist and steam from its summit. This stretch of isolated coastline offers one of the best viewing and photographic opportunities for the Alaska Brown Bear. We were fortunate to get 4 days of beautiful sunshine on our trip which is unusual in Alaska during the summer. Our group (6 photographers) photographed a total of 28 different bears; sedging (eating the native grasses), digging for clams at low tide on the tidal flats and fishing for salmon in the mouth of Shelter Creek. This photo shoot was the best shoot that I personally have been fortunate enough to take part in. NOTE!!! Many more photos to come. 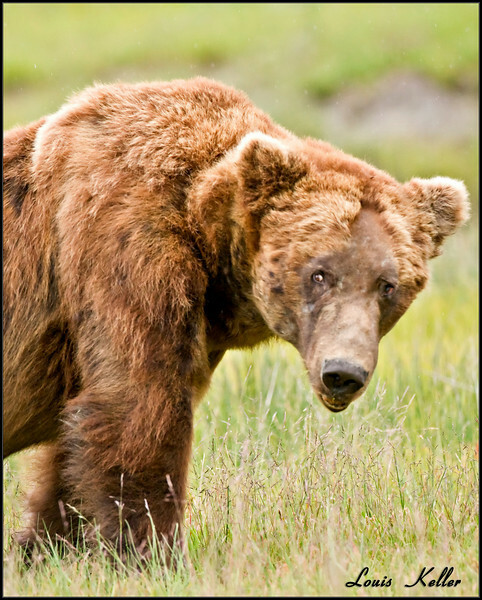 Check Alaska Brown Bear under Photography Albums.